SAN DIEGO – Nov. 17, 2016 – Competitor Group, Inc. (CGI), operators of the Rock ‘n’ Roll Marathon Series, today announced a new multi-event sponsorship agreement with United Airlines, under which the airline will become title sponsor of two Rock ‘n’ Roll Marathon Series events in Washington D.C. and San Francisco beginning in 2017. 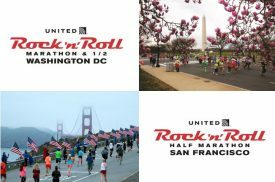 The United Airlines Rock ‘n’ Roll Washington D.C. Marathon and Half Marathon is scheduled for Saturday, March 11 and the United Airlines Rock ‘n’ Roll Half Marathon San Francisco will take place on Sunday, March 26. The events annually combine to welcome more than 35,000 runners from around the world. With today’s announcement, United adds two premier events in hub markets to its portfolio of race sponsorships around the globe. Employees and customers travel from far and wide to participate in these events, and in similar races, employee volunteers from the airline have a robust presence cheering on the runners and assisting with day-of activities. United MileagePlus™ customers will have access to exclusive pre and post-race events, such as an invite only dinner the night before, as well as discounts on entry fees for each race. The Rock ‘n’ Roll Marathon Series is known for an unparalleled participant experience, which fills miles of roads with music and entertainment at 30 destination events around the world every year. The United Airlines Rock ‘n’ Roll Washington D.C. Marathon features one of the most iconic start lines in running at 14th Street and Constitution Avenue adjacent to the National Mall. The route takes runners on a tour of America’s historical monuments and D.C.’s eclectic neighborhoods including Adams Morgan and Capitol Hill. It is the only marathon run entirely in the District of Columbia, featuring live bands along the course and culminates with a Finish Line Festival at RFK Stadium. The United Airlines Rock ‘n’ Roll Half Marathon San Francisco takes participants from Ocean Beach along the Great Highway with sprawling ocean views, through the Presidio, across the Golden Gate Bridge and along the Crissy Field shoreline with skyline views before ending in the heart of the city, in front of City Hall. Each event is known for placing entertainment along the course, lining the route with fanfare and then topping the experience off with a finish line celebration and concert. For more information, please visit www.RunRocknRoll.com or follow @RunRocknRoll on Twitter. United Airlines and United Express operate more than 4,500 flights a day to 339 airports across five continents. In 2015, United and United Express operated more than 1.5 million flights carrying more than 140 million customers. United is proud to have the world’s most comprehensive route network, including U.S. mainland hubs in Chicago, Denver, Houston, Los Angeles, New York/Newark, San Francisco and Washington, D.C. United operates more than 720 mainline aircraft, and this year, the airline anticipates taking delivery of 21 new Boeing aircraft, including 737NGs, 787s and 777s, as well as six used Airbus A319 aircraft. The airline is a founding member of Star Alliance, which provides service to 192 countries via 28 member airlines. For more information, visit united.com, follow @United on Twitter or connect on Facebook. The common stock of United’s parent, United Continental Holdings, Inc., is traded on the NYSE under the symbol UAL. With more than 500,000 runners taking part in 30 destination events around the world every year, more runners choose the Rock ‘n’ Roll Marathon Series than any other running series. The simple idea of making running fun has transformed the U.S. running landscape by infusing the course with live bands, cheer teams and entertaining water stations, creating a block-party atmosphere for participants and spectators alike. Over the 19-year history of the Rock ‘n’ Roll Marathon Series, charity partners have raised more than $320 million through the events for a variety of worthy causes. Race weekend kicks off with a free Health & Fitness Expo showcasing the latest in running gear, sports apparel, health and nutritional information and much more. Events culminate with an entertaining finish line festival and Toyota Rock ‘n’ Roll Concert Series featuring some of the biggest names in music. Further information about the Rock ‘n’ Roll Marathon Series can be found online at RunRocknRoll.com.